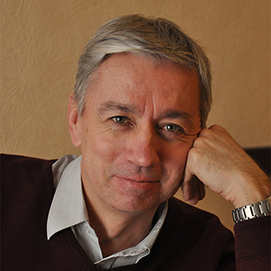 Alexander Belyakov was born in 1962 and graduated from Yaroslavl University Department of Mathematics in 1984. Belyakov worked as a software engineer, journalist, editor, and as a head of the regional administration press office. He began publishing poems in 1988 and his first collection, Comfortlessness Ark, appeared in 1992. Belyakov is now the author of nine poetry collections, one book of prose and numerous publications in major literary magazines in Russia, including “Znamya,” “Druzhba narodov,” “Vozdukh,” and others. Alexander Belyakov translated poetry from English and his own poems have been translated into Italian.